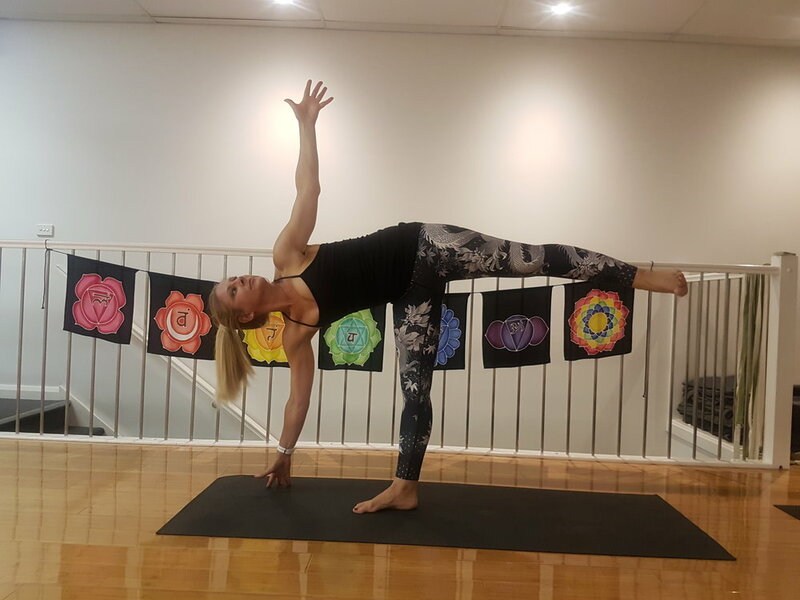 Here at Mudita we love to celebrate our students and their yoga journey both on and off the mat. What originally brought you to yoga? Hip pain, I needed to fix it and it worked. But then, I fell in love with yoga and this has made me keep coming back. Tell me about your journey on the mat. I have been practising for 4 years now and I have just done a thousand hours on the mat, which is awesome! I have come a long way from, I guess, a lot of 'watch asana', watching what everyone else is doing to really just being able to do my own thing. This has been a big hurdle for me, a part of my journey. Off the mat yoga has taught me to be a more calm person, not as fiery and to be able to contain that fire and use that energy in my practice and turn it into movement. What do you love about Mudita? I feel like I've watched the studio grow into this amazing community and we are all here to support each other. Whenever you walk in the door there is always a heap of people just smiling at you and you are like, 'that's nice, I feel accepted, I feel a part of this.' Everyone is welcome. I love coming here, I love the space and I love being a part of it! What is the one thing you would share with a new student?Everyday is a practice in yoga! One day things seem easy, another day things seem harder. But yoga is a strengthening practice, it strengthens you both in your body and mind. The more you do it, the easier it becomes. I practice everyday - keep trying, it helps. What are the benefits you have experienced from a regular yoga practice? Mindfulness, the more you practice something the more it naturally becomes a part of you. Colleagues will comment that I am so much calmer, or mention that I have really great posture, and I say, 'Yeah, I practice yoga everyday!' On holiday my dad commented on my breathing, and I said, 'Yes that's part of a yoga practice!' A lot of these benefits I hadn't even noticed, it is lovely to hear. Also, I have less pain, for sure. I haven't felt pain in most of my joints for a really long time now which is awesome. I credit it to my practice and moving my joints. Another great benefit is strength. I am stronger now, I can lift things. I've got muscle definition that I never had before as an adult. Doing this you get muscles and you feel good about how strong you are. Do you have any specific goals on the mat?YES, I want to be able to do a handstand! Another major goal of mine is to be more focused on the mat. I also want to keep on practising. I don't want to stop, I want to be one of those 90 year old yogis doing incredible things on the mat. It is inspirational when you see that and it's simply that yoga has become a part of their existence, a part of their daily life. What is your favourite asana, and why? Downward facing dog - I feel really comfortable there. What is your favourite food? That's hard, I just love good food, but I think fresh cherries would have to be my pick. What originally brought you to yoga? I used to be a half marathon runner. About four years ago, I developed a stress fracture in my tibia from all of the training. The doctors told me that I had to take a year off running to allow my leg to heal. I was devastated at the time as running was really important to me. About the same time, I noticed a new yoga studio had opened up in Charman Road. As I couldn’t run I thought I would try yoga for a while instead. That decision changed my life. I now practice yoga on an almost daily basis, and I never went back to serious running. Tell me about your journey on the mat. Yoga has become such a big part of who I am. It’s changed me both mentally and physically. I’m much more grounded and grateful than I used to be which in turn has made me a happier person. Physically I am much stronger now. I used to have skinny runner’s arms. They now have muscle definition and can hold my body weight in an arm balance. I also continue to see improvements in my flexibility, like recently regaining the ability to do the splits for the first time in 30 years. What do you love about Mudita Yoga Studio? Mudita is my “happy place”. The people who go there are always so friendly and supportive. Whether I’ve had a good day or a bad day, a sad or a stressful day, I know that I will always leave Mudita calmer and lighter then when I walked in. My husband often comments that I’m always so happy when I come back from a yoga class and he’s right. The community that makes up Mudita is amazing. There are so many teachers and students that have passed through those doors over the years who have enriched my life in one way or another. Gina especially has been an awesome mentor and teacher to me and I am so grateful for the knowledge she has imparted. What is the one thing you would share with a new student? Don’t be afraid to fall every once in a while. It’s sometimes how you ultimately learn and grow in your practice. And don’t forget to laugh. Yoga shouldn’t be taken too seriously. That pose you are striving for may just not be available to you YET. But with a consistent practice, it’s amazing what you can achieve. I’m calmer than I used to be. Although I think it’s an area I could definitely continue to work on. I’m also a lot stronger and more flexible than I used to be which feels really empowering. People often say to me that they are not flexible enough or fit enough or strong enough to practice yoga. It’s simply not true as a regular practice will improve those things no matter where your starting point is. Do you have any specific goals on the mat? Yes, I’m always working of trying to achieve something. I love to challenge myself and the feeling you get when you suddenly achieve a pose you’ve been practicing for a while is fantastic. At the moment I am trying to hold my handstands and pincher pose for longer and to one day have the confidence to move away from the wall. I also continue to work on both my focus and breathing both on and off the mat. Remaining present continues to be a challenge for me but regular practice does help. What is your favourite asana, and why? I have so many asanas I love to practice and a few I don’t. (That would be you broken toe pose.) But probably my favourite all time poses would be the warrior poses. They are such strong and empowering asanas. I’ve also recently learned to do a chin stand after many months of practice. So every time I successfully do one now during a class, I internally do a little happy dance. Nature. I love to go camping with my family and get away from modern life for a little while. It’s really restorative and brings me back to the things that are really important to me. I love most food but probably Indian cuisine is my favourite. But I’m also quite partial to a nice cheese with a good drop of shiraz as well. Everyone’s yoga journey is different. The physical and mental challenges that I face on the mat are completely different to the person on the mat beside me, which is why I try much harder these days to focus on my own practice. I’m sure that as I continue to get older, my yoga journey will evolve and I hope that I will continue to practice with love and dedication for many years to come.